No big story behind this one. I just needed something new to make and here we have the result of 2 weeks of work. I’m still surprised how good it feels to create pictures like that one. Once you’re done with the picture, it’s like you let the people look into the photoalbum of your imagination. Skim through each page and discover new worlds. A little explanation to the title. When i started the painting i did not have that ruin sit on that mountain thingie there. The mountain then looked much like a wolf teeth peeking into the sky. I never got away from that title… so i left it. A friend of mine made fun of the title and named it “World Of Lurking Faeries”. Bullseye. Once again i worked with digital matte painting techniques. Lots of photo reference. 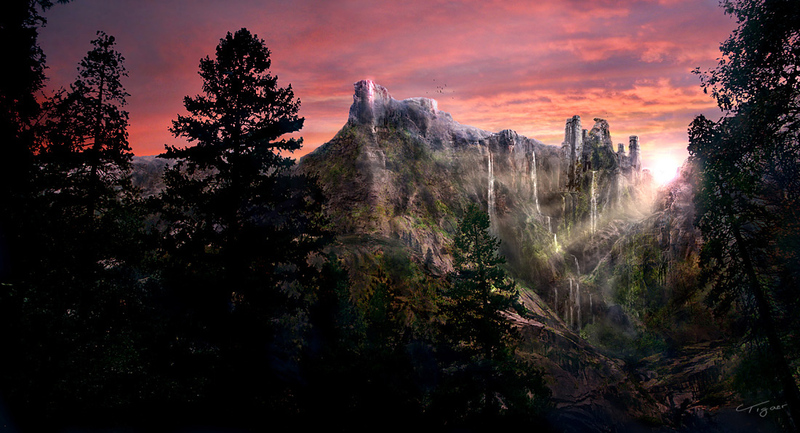 The waterfalls were created with 3dsmax. It was just a test i did. The render suited the painting… so i used the waterfalls in it. Wallpapers can be found in the gallery. This entry was posted on Saturday, March 3rd, 2007 at 17:19	and is filed under Paintings. You can follow any responses to this entry through the RSS 2.0 feed. You can leave a response, or trackback from your own site.